You know that creating content is an important way to attract visitors to your website. SaaS businesses find content especially useful for collecting leads and turning them into sales. You may be crafting the content yourself or outsourcing it. In either case, your content probably looks the same as everyone else’s: A standard, run-of-the-mill, plain ol’ blog. Blogging is useful, but it’s boring. Each topic is isolated from the others. There’s no structure or cohesion. You don’t give your readers much reason to explore more of your content. That can all change with the hub and spoke strategy. The hub and spoke strategy is a way to organize the relationship between pieces of content. 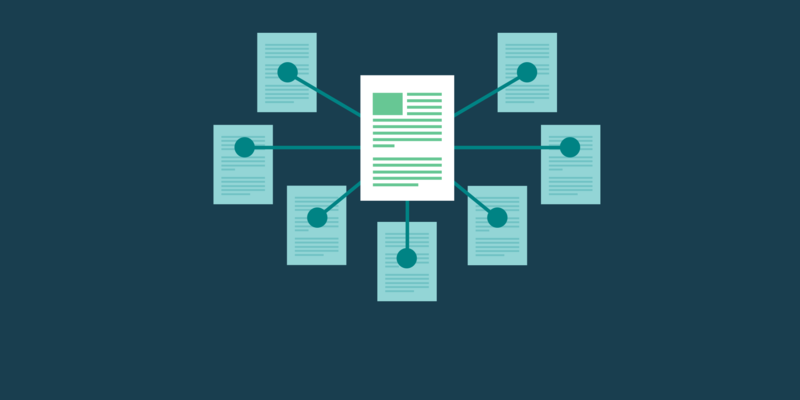 It adds weight to your content by teaching the reader the entirety of a particular topic. The hub & spoke #contentmarketing strategy adds depth and value to your content. The hub and spoke strategy consists of a main page (the hub, like you’re reading now) with a section that addresses each sub-topic. The sub-topic sections link to a series of articles (the spokes). Each article dives in depth into that sub-topic. This strategy fits easily into your regular blogging process. The major difference is the planning stage, where your main topic is broken into manageable sub-topics. Once you’ve generated your sub-topics (the spokes coming off your hub) and placed them into an editorial calendar, you can create your content as usual (or have someone else create it). Even though creating hub and spoke content doesn’t require much more resources or time than traditional blogging, the unique arrangement of the content adds more value to your readers’ lives than blog posts ever could. The structure puts all of the information about a particular topic in one place so the reader doesn’t have to hunt for more answers. It’s also easy to browse and reference, so readers are inclined to bookmark it. This resource will explain how to create and promote a hub and spoke content strategy for your website. Learn why the hub and spoke strategy is NOT like traditional blogging. Your hub and spoke strategy requires the creation of at least eight articles (the spokes of your hub). These articles are similar to standard blog posts. They are educational pieces of content designed to teach a single component of your hub and spoke topic. Each article should have a clear idea, a compelling and descriptive title, and an easy-to-understand writing style. The best received blog posts are at least 1,200 words. In order to capture potential customers, your spoke articles should be optimized to capture leads. Each article should end with a call to action that links the reader to a landing page that offers a lead magnet in exchange for the reader’s email address. Furthermore, each article should offer at least two opportunities for the reader to access a content upgrade. Since your spoke articles are individual pieces of a comprehensive topic (your hub), they all have to be planned before you start writing. Unlike typical blogging, these topics can’t exist as isolated little islands. You need an overall hub and spoke strategy in place and writers ready to craft quality content. Read more: Content Upgrades: What Are They and Why Use Them? Well-established businesses have a unique opportunity to create valuable hub and spoke content. Their experience working with their customers should give them a keen understanding of those customers’ problems. What do they complain about most? What do you find yourself teaching or explaining most often? If you have answers to these questions, much of the hub and spoke planning should happen quickly. Even if you don’t immediately know what problems to solve with content, discovering topics is simple because of your existing wealth of information. First, interview your ideal customers, then create buyer personas that represent their needs and problems. Furthermore, established businesses may already have content that can be packaged into the hub & spoke structure with little effort, providing it meets the hub and spoke strategy’s requirements. Anytime you create content for the web, keywords are important. Most of your readers will find your content based on the keywords they input into a search engine. You want to use those keywords in the correct places in your articles so search engines (and we’re really just talking about Google) categorize and display your pages properly. Performing keyword research for the hub and spoke structure is different than general keyword research you would perform for the product-focused areas of your website. Instead of focusing on product-related words, you need to focus on keywords that are specific to your topics. Google Analytics is a free a keyword researching tool, but there are other options that can provide more meaningful information. Once you collect relevant keywords, your job is to use them naturally throughout your hub and spoke content. Lead magnets are essential tools in the online marketer’s toolbox. This is because email marketing provides the best ROI of any marketing strategy. Basically, a lead magnet is something given to your website readers in exchange for their email address. Once they’ve subscribed to your list, you can nurture those leads with content delivered to their inboxes. You can use their engagement with your emails to qualify your leads and eventually sell to them. There are several key ways to use lead magnets throughout your content. Some tools include website overlays, toaster “popup” widgets, content upgrades, slide-out boxes, etc. Most importantly, lead magnets should be served at the end of an article once the reader has realized the full value of your content. Your hub and spoke landing page (the hub page) is the most important component of the entire strategy. It ties each piece of content together, giving the group depth and gravity that you don’t find in ordinary blogging. It’s the piece that makes the group more valuable than the sum of its parts. The hub page should be laid out with a pleasing, easy-to-use design that facilitates browsing. Think of this page like a resource center. Your readers should want to bookmark the page so they can reference it over and over in the future. Your hub and spoke content can only take you so far. It’s a great method to attract website traffic and convert them to leads, but you need a proper marketing funnel in place to qualify those leads and turn them into paying customers. Your hub and spoke content is the top of your funnel. As visitors consume your content, they subscribe to your list via your lead magnets. Once they are on your list, you need smart automation and deft use of an email marketing tool (or customer relationship management tool) to identify and approach the leads that are most likely to buy your product. Your hub and spoke content can also be used to nurture your leads over time and position yourself as a valuable authority on that particular topic. This is a great way to turn warm leads into hot leads. You can let your readers find your website through search engines, but often it’s smarter to take a more active approach to content promotion. You can do this by approaching influential people that work in the same industry or field. When they share your content with their followers, you benefit by being associated with their trusted brand. You can take content promotion a step further by reaching out to influencers before you create your content. This gives the influencer an opportunity to contribute in some way (perhaps a quote). The influencer is far more likely to share the content if it promotes them as well. Plus, the content is more valuable because it includes the contribution of an expert. Furthermore, it’s important to take advantage of the usual content promotion tactics: Email marketing, social media marketing, and community outreach (forums, Quora, social media groups, etc.). The main goal of the hub and spoke strategy is to pack more value into your content than a traditional blogging strategy can provide. By making your content more useful than other websites, you’ll capture more traffic, more backlinks, and you’ll create a bigger social buzz. Once you’ve created all of the pieces of your hub and spoke content, there are still ways to squeeze more value out of your work. The content you’ve already created can be neatly packaged into an eBook that’s given away on your website. It can be quickly turned into an email sequence for new subscribers. It can be linked to customers who need those solutions. It’s a prime target for paid ads. It can also serve as the foundation for a video course. Most importantly, the key is to find ways to use your hub and spoke content beyond the usual means. Unlike typical blog posts, you don’t want to create it and forget it. Blogging isn’t good enough anymore! Learn why the hub and spoke strategy is better. Expect to see more email signups on your hub page and spoke pages. Users who are exploring these pages are hungry for information, so they’re more likely to subscribe to receive your lead magnets. Plus, you’ve supplied them with an impressive level of value they just can’t find on other websites. In terms of analytics, your time spent on the hub page will be low because most people will only use it as a reference once they’ve read it the first time. The easy-to-reference nature of the hub page will attract more backlinks than other pages of your site, which also causes higher unique traffic. Once you’ve finished your hub and spoke set, don’t forget about it. Feel free to use those spokes as spokes of your next hub if the topics are relevant. Interlink between hubs generously to create strong SEO signals and a fluid user experience. Remember: Your content is the top of your marketing funnel. Your goal is attract and convert visitors. The only way to do that is by providing exceptional value. Create excellent content, and you’ll be rewarded with fans. Learn how the hub and spoke content strategy is different than typical blogging. Subscribe to receive this extra resource.